Click Here - To see how Wilkes County evolved each decade - includes all the known towns and villages. Click Here - To view the significant Education events for Wilkes County since the county was formed. Click Here to go to the official website of the Wilkes County government. Click Here to learn more about the known airports in Wilkes County. The Old Wilkes County Jail was constructed in 1859 and opened as jail in 1860. The history of its usage goes back to the War Between the States when it was used to house Confederate provisions as well as Union prisoners. After the war, Tom Dula (of the famous ballad "Hang Down Your Head Tom Dooley") was incarcerated here until the change of venue was obtained by his defense attorney, former Governor Zebulon Vance. Another famous inmate was that of North Carolina's famous escape artist, "Otto Wood." The building was restored to its original state using as much of the original materials as possible. Access to the cells are through the original iron and wood doors. The Old Wilkes County Jail is one of the best-preserved examples of nineteenth century penal architecture in North Carolina. Of particular note is the survival of its primitive security, including the front door which contains nails an inch apart so that if a prisoner got hold of an object that he could not saw his way out of the building. The Act establishing Wilkes County stipulated that the first court was to be held at the home of John Brown. Commissioners were named to select a place centrally located for the construction of a court house, prison, and stocks. The second court was held June 1, 1778, in the "bent of the Yadkin." The next day, it was held at Mulberry Field Meeting House. One June 3rd, the commissioners who were to select a site for the county seat reported, "We, the commissioners appointed by Act of Assembly to lay out and appoint pillory and stocks of the said county, have met and materially considered the same, do adjudge and appoint the place where the Mulbury Meeting House stands as the most central, suitable, and proper place whereon to locate public buildings." In September of 1778, court was held at the court house in Wilkes County - known as Mulberry Fields and Wilkes Court House. In 1795, an Act was passed naming new commissioners to select a site for the erection of a court house, pillory, and stocks. It also named commissioners to purchase fifty acres of land on which to lay out a town and to erect public buildings. By 1801, Wilkesborough had been laid out at the court house. In 1823, an Act was passed authorizing a new court house to be erected on the public square in Wilkesboro, which has served as the county seat ever since. Wilkes County was named after John Wilkes, a noted supporter in Parliament of the American cause. Wilkesboro is the county seat of Wilkes County, which was created from Surry County. A Moravian surveying party passed through the area in 1752, and documented that a Cherokee Indian village stood in the old fields. The Cherokee translation for Mulberry Fields is "Keowee." Keowee was often used by the Cherokees as a place name during the Colonial Period. The Act establishing Wilkes County stated that the first court would be held at the home of John Brown located at the bend of the Yadkin River on March 2, 1778. Commissioners were named to select a place centrally located for the erection of a courthouse, prison and stocks. On June 2, 1778, Mulberry Field Meeting House was chosen to serve as the court house. During the Revolutionary War, the Mulberry Fields area was a common mustering site for the Wilkes County Militia. The Mulberry Meeting House was a common meeting place to discuss local government issues of the day. Click Here to learn about all of the known officers and men who served in the Wilkes County Regiment of Militia during the American Revolution. All names in "blue/underscore" can be clicked on for additional information. In 1795, An act was passed naming new commissioners to purchase fifty acres of land on which to lay out a town and erect public buildings. Mulberry Fields became Wilkesboro in 1800 when the town was laid out by William Lenoir. Lenoir refused to allow the town to be named after himself. Later, following his death, the next town up the road was named for him - Lenoir, NC. 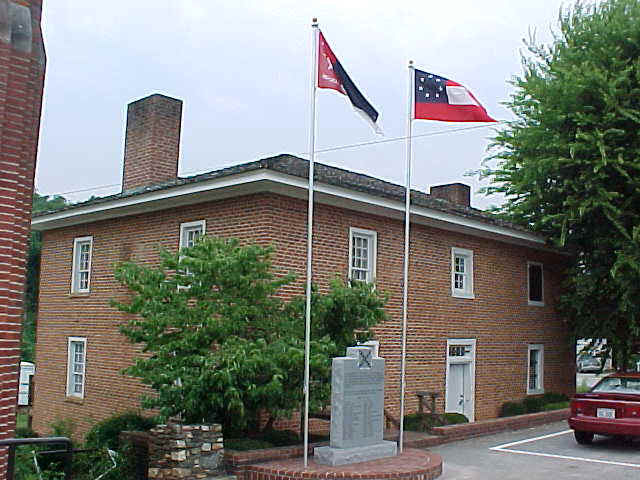 Wilkes County has a rich and varied history involving the Revolutionary and Civil Wars. 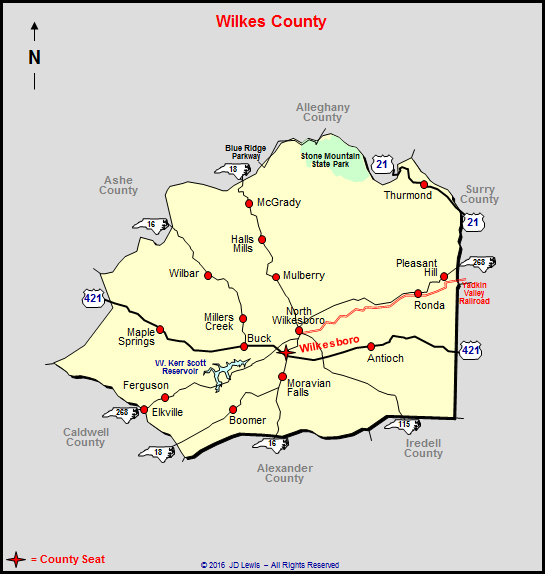 Click Here to view / download eight road maps of Wilkes County.